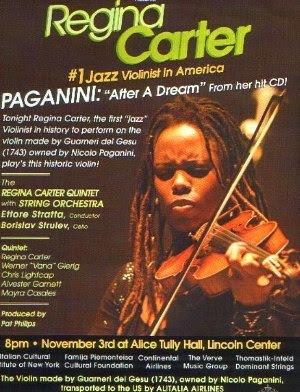 Regina Carter plays Paganini's Violin! The great violinist, Nicolo Paganini, willed his marvelous violin to Genoa - the city of his birth - but only on condition that the instrument never be played after his death. It was an unfortunate condition, for it is a peculiarity of wood that as long as it is used and handled, it shows little wear. As soon as it is discarded, it begins to decay. The exquisite, mellow-toned violin has become worm-eaten in its beautiful case, valueless except as a relic. The moldering instrument is a reminder that a life withdrawn from all service to others loses its meaning. This is a striking illustration: the Death of the Unexercised Gift. Extraordinarily poignant. Heartbreaking in its implication of irretrievable loss. And utterly without basis in fact. Far from moldering in its display case in Genoa, 'Il Cannone' ("The Cannon") as Paganini dubbed it not only gets a minimum of a monthly playing by its curator, but (under armed guard) has been lent out to world-renowned violinists for special concerts and recordings. Thanks be to God for living music! Just say no to those who deny its power to be born anew! I like the story, and the additional audio! Thanks for sharing this! BTW--I'm reading this from Panama. Your devotionals have been a blessing to me from afar over the past week or so. Please continue!